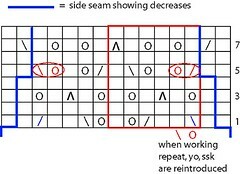 Q: When I get to pattern 2, where do I start in the chart when decreasing? How does that work? A: When decreasing in lace (or increasing for that matter) the most important thing to remember is to make sure every yo is paired with a decrease. Why? Well, a yo is an increase and if it is not paired with a decrease to keep the pattern balanced, things can get very ugly very quickly! Of course there are exceptions to every rule, but we aren’t talking about those types of lace patterns here. So, after doing the specified shaping, and a yo/decrease pair do need to be left out then what happens? Any extra stitches left over are then replaced with either knit or purl stitches (depending on the pattern you are working with – it’s usually the ground stitch). Here is chart 2 with the first 2 decreases marked out in blue. 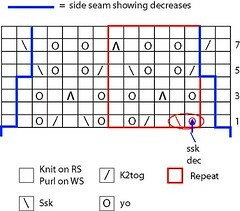 The directions say: Dec Row: (RS) K1, ssk, work in pattern to last 3 sts, k2tog, k1. But what does this really mean in terms of where you start your pattern on the chart? Looking at the chart, you have a k1, followed by a yo, ssk. That’s not going to work because you need to add in a decrease. So this yo, ssk pair will need to be dropped. And at the end, same thing. You need to slip in a k2tog decrease, but you have a yo, k2tog in your way. This yo, k2tog pair will need to be dropped. For row 3 the only change is we have one less stitch at the beginning and end. So instead of beginning and ending with 2 stitches, we now only begin and end with 1 stitch. Again, the first and last yo/decrease pairs are going to be in the way so they need to go. And here is our chart with the decreases added. 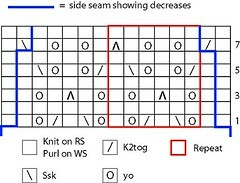 So row 5 now looks like this: K1, ssk, k1, yo, ssk, k1, *k2tog, yo, k1, yo, ssk, k1; rep from * to last 6 stitches, k2tog, yo, k1, k2tog, k1. 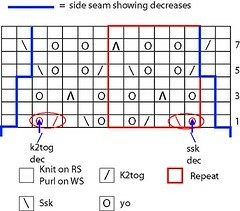 So for row 7 we now have: K3, yo, k1, sl1-k2tog-psso, *k1, yo, k2, yo, sl1-k2tog-psso, rep from * to last 4 stitches, k1, yo, k3. On a piece of graph paper and with a pencil, mark out a few pattern repeats + the beginning and end stitches. Then mark in every decrease (like my blue side seam line in the charts above). Erase any yo/dec pairs that interfere with your shaping and add in your decreases and changes in pattern as needed. Shaping in lace does take a little bit of practice, but with a little bit of patience, it will all start to make sense!